Many of us live lives constrained by beliefs that we can’t do things. I’d like to look at those constraining beliefs from a different perspective. 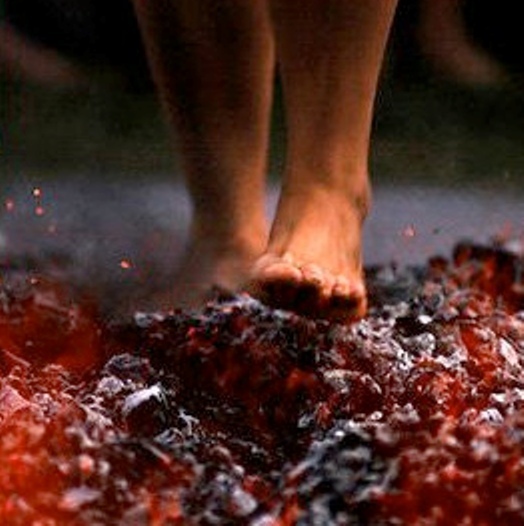 Have you ever heard of FIREWALKING? It’s just what it sounds like: walking on fire. Lindsay, of course, didn’t do that either. She did. We made a restroom stop on the way out, so we were the last to arrive in the firewalk area. It was dark—lit only by giant bonfires from which hot coals were being shoveled out, and placed on the “firewalk paths,” which were 10-to-fifteen feet long—just beds of hot, glowing coals. We got separated—you don’t do this exercise with your friends or family. There were, maybe, ten lines of people waiting to firewalk. It’s dark, I’m at the back of my line, and I’m thinking, “Now, wait a minute. Does this make sense? Lindsay might get hurt! But she’s not going to do this. It’s me who’s considering it. This doesn’t make sense! Why risk burning my feet—how am I going to run through airports all the time, as I do, if my feet are all burned? Then, as the line slowly moved forward, I noticed a number of people got to the front of the line, and suddenly there were people on either side of them speaking directly into their ears, and then they would turn and walk back to the hotel—no firewalk. Okay, so it’s an option right up to the last minute: one doesn’t have to do this. It’s dark—who even notices who firewalks and who doesn’t? As the line moved a bit more, I started thinking, why would anyone do this? It’s a risk, and there could be serious injuries! There are ambulances ringing this entire scene, I can see them in the glow of the bonfires. Why take a chance? Then, as the line moved a bit more: What would it mean to me if I actually did this? They’ve told us that, if you’ve ever burned your finger on the stove, if the stove was on “high” at the time, you probably experienced 600 to 650 degrees Fahrenheit. And you were burned in a split second. These burning coals are between 1,700 and 2,200 degrees Fahrenheit. And you’re not just touching them for a split second; you’re walking across them. And there’s no running. This is about concentration, so you can’t run, because if you do you might fall, and when you fall you’ll lose your concentration and you really will be burned. You have to walk deliberately. Hmm…so if I did this, it would mean that a lot of other things in life I’ve told myself I cannot do, I probably can. It would cause me to question, really, everything—if I can do this massively illogical thing and walk, in my bare feet, across 2,000 degree burning coals, and be uninjured, well, then, most anything is possible. It will be very hard for me to say “I can’t do that” about anything, ever again. I started to get pumped up. Now I’m very near the front of the line. I notice the person who is two people in front of me chooses to walk back to the hotel—no firewalk. Then the guy in front of me gets talked to for a long time. It was amazing! I had had no thought that Lindsay would actually participate, but she did, and she learned something I wish I’d known at the tender age of eighteen: we are capable of much more than we think. I share this with you as input to your thought process. You can do many amazing things, or you can choose to be limited by what you’ve done before or what logically seems to be impossible for you.